Radio interview by Susan Lindauer LIBYA ON FIRE with me. Press TV has conducted an interview with Susan Lindauer, a former CIA asset from Washington, about the United States spying on its people as well as its European allies. Below is an approximate transcription of the interview. Press TV: How vast and extensive is this NSA spying program? Lindauer: It has been revealed that the NSA spied on 124 billion phone conversations throughout the world in a one-month period. Thus it is enormous; it is beyond the scope of comprehension for ordinary citizens but the implications are vast because it is a Stasi program whereby it applies to industrial espionage. But it also allows the United States to impose our laws on other countries on an extraterritorial basis and we are hunting down citizens of foreign countries whose activities might very well be legal within their own country, but which violate our own US policies. And then we are sabotaging them or even arresting them and extraditing them to the United States for prosecution and this goes well beyond terrorism cases. So, it is something that ordinary citizens should be afraid of; it is not just the government elite that should be. This is affecting the whole society. Press TV: Susan Lindauer, you talked about industrial espionage and I would like to get your idea about what the NSA did which is deemed to be illegal and that is spying on banks and credit card transactions, the European SWIFT financial transaction network being tapped on different levels. I mean isn’t this first of all in violation of national laws and global regulations? Lindauer: The United States is trying to force all countries of the world to obey US banking laws and to obey US financial standards and these are not necessarily reasonable demands. It is one thing if you are saying there should be a standard for all countries that the United States adheres to; it is another thing if you are giving advantages to the United States to US corporations and that tends to be what happens is the trade practices benefit the United States and the tide is back to Angela Merkel. We are spying on these people; we are spying on ambassadors; we are spying on senior diplomats and we have been doing it for years and I think that what is very interesting to me as a former CIA asset is I know very well that at the United Nations which was my old stomping ground, we frequently targeted Security Council members. This was very normal behavior for the past ten years. I would say even before 9/11 we were doing this and we went after the ambassadors and the diplomats and this was considered routine spying by the United States, but what has changed is the United States is no longer the dominant force of power that decides, that can dictate. The world is no longer tolerating our abuses, the way that they always have in the past and I think that that is the big change, that is the big shock to Washington is that they are standing up to us really for the first time, but we have been doing this for years. It is a fact; we have done this forever. Press TV: Susan Lindauer, what is your reaction to Richard Weitz (the other guest on the show)’s comments there? Lindauer: I will give you that. That is a fair comment. However, I would tell you that if there is a defense contract, if there is something that is especial that would give another country an advantage in the market. The way the United States government could do it would be to contract with a private corporation secretly to develop a parallel plan to develop the same product and try to beat the other one to the market or the beltway bandits do this stuff all the time mostly with defense contracts. But again America is not producing as much as we were in the past; we are not a strong manufacturing base. So, this is more banking controls, currency controls and military, I would say, and any sort of military application the United States would absolutely hand it over to one of our own contractors and try to beat the foreigners. Yes, I would say. But I think that the real challenge here right now is that the international community, France, Germany, they are very angry and they are standing up to the United States for the first time and that is the big change because we have done this for years. This is not new. I mean I am very proud of Edward Snowden and I support him for telling the American people and his disclosures are tipping point, but it was pointed out that if he would watch CNN ten years ago when he was in high school, he would have saved himself the trouble because all of this stuff was on 60 minutes and was revealed by previous whistleblowers. So, there is nothing new in what he has told except that our world has now changed and people are ready to challenge and they no longer feel obligated to submit to the United States. They no longer feel docile and patronized by the United States. This is a huge change and from an intelligent standpoint, it is a little scary, I will tell you. But it is good for the global democracy; it is; it is good for the global communication, but the United States is sleeping; it is definitely sleeping and this shows it more than anything that I think we have seen whether you are happy about the decline of the United States or not. Press TV: What do you think of the comments made by the viewers on our Facebook page regarding the topic of this debate? Lindauer: Absolutely and I would agree with your commenters. The real problem with the spying is that it is not new, but the United States has been expanding its police state mentality and we are seeing a shift here in the United States where freedom is considered more and more of a threat. It is still sort of a fringe idea, however, it is moving with a frightening speed and we are afraid of what is coming that there will be some kind of clampdown. I can tell you that in May I was visited by the secret service, wanting to know if I had any guns which I do not, wanting to know what organizations I belong to, what radio shows I listen to because I do have a radio show of my own on Truth Frequency Radio and I have now become a target because I am so outspoken on many of these issues and so I am now having to answer to the government for my own dissident viewpoints. That is why a police state is so frightening and when the United States tries to apply its values extraterritorially, we do it in the name “anti-terrorism” but what we grab, what we pull in has nothing to do with violence. It is far more insidious than that. If you have a policy, if your actions could be entirely legal within your own country but your actions contradict our policy objectives, then we are going to come after you and I can tell you that that is happening more and more and the leaders really have an obligation to be angry on behalf of their citizens. Your commenter was absolutely correct that it is a little bit disingenuous for Merkel to say it is ok to spy on the German people, but do not spy on me. It has got to be good for all of us. You know, this is the problem. Press TV: What is your reaction to Richard Weitz’s comments? Lindauer: Truth has become treason in Washington. The more degraded the United States economy becomes, the more we are falling in global standing, the more free speech and ordinary dissension threatens the power elite and in the opinions of many Americans, the power elite are classifying all sorts of things that should be disclosed to the public, so that they can protect their power and they can protect their control over society and they do not want any accountability to the people. 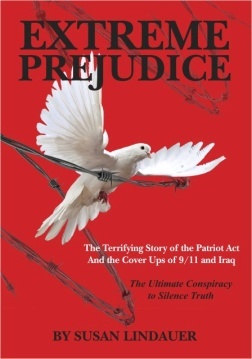 I think I should tell you at this point that I am one of people who gave advanced warnings about 9/11 and I personally contacted the office of attorney general John Ashcroft and the office of counterterrorism in August of 2001. We could have stopped that attack; a decision was made at the highest levels not to do so and that is the problem. You are correct we are being inundated with information, but there is always an ulterior agenda and if something is being allowed to happen, the Boston Marathon bombing, I am not convinced that we did not know about that attack beforehand. I think that our government is afraid of us; our government is very afraid of the people and that is a very dangerous government and I think that in the next few weeks, if there is an economic collapse, a lot of us are afraid of what is going to happen within the United States and it may be that the rest of the world will be looking back on this as the calm before the storm before our hell breaks loose and when it does, I am afraid of what will happen to the American people like me who are honest dissidents who support non violence. I am afraid of what they are going to do to us. You think it is bad for you. Press TV: Susan Lindauer, what are your final comments on the issue? Lindauer: I think that Edward Snowden believed that he was doing something very good for the world and believed that he was defending freedom. I think that his revelations are not new but it is a tipping point for our society and it really shows the United States is falling in the world’s estimation and the United States is more vulnerable than it has ever been in the past. And as we go down, I feel very sad because I love this country and I realize that I am talking to a foreign audience and you do not have the same feelings that I do for my country. But I want America to be strong and good and I think that we have lost something and I do not know how we are going to get it back. Congressman Alan Grayson and former congressman Ron Paul are two of the fiercest warriors against an out-of-control Federal Reserve. So when the two of them support a Fed-related solution to the “government shutdown” crisis, I listen. A simple solution to the impasse is as follows: Federal Reserve Chairman Ben Bernanke should simply cancel the Treasury debt that it owns. The government can just forgive the government’s debt. Yet canceling this debt would give the government substantial room under the debt ceiling to manage its finances. It would end the debt ceiling standoff in Congress, and it would prevent a default. The debt held on the balance sheet of the Federal Reserve can be canceled without any significant consequence, because it is a bookkeeping artifact corresponding to the money supply. In essence, the government owes this money to itself. If I owe money to myself, I can cancel that debt at will and without consequence, essentially taking it out of my left pocket and putting it in my right pocket. Last year, the Federal Reserve declared a “profit” of roughly $91 billion, much of which came from interest payments from the U.S. Treasury. The Federal Reserve then quickly remitted nearly all of this profit right back to the U.S. Treasury. The Federal Reserve does this every year. Reducing or eliminating this unearned “profit” actually will provide a more realistic view of federal finances. I am a Democrat, and known as a progressive. But this idea was put forward a few years ago not by me, or by a member of my party, but by Republican Representative Ron Paul. He thinks, as do I, that the Federal Reserve‘s dramatic expansion of its balance sheet is simply a way of financing the government by printing money. The Fed isn’t really “buying” Treasury bonds, it is just letting the government finance its deficit by adding to the money supply. While canceling the Treasury debt held on the Federal Reserve balance sheet might be considered unorthodox, it is no more unorthodox than the quantitative easing that has added much of this debt to the Fed’s balance sheet. Indeed, quantitative easing – the radical program the Fed has engaged in for years, which doesn’t help the economy, benefits the the super-elite and hurts the little guy, and more than offsets any savings from budget cuts in other areas – is largely performed through buying U.S. debt … $45 billion each month. In any event, preventing a financial meltdown, with its attendant risks of interest rate and price spikes as well as staggering employment losses, is certainly central to the Federal Reserve‘s mandate of ensuring price stability, maximum employment and moderate, long-term interest rates. Bernanke could alleviate the debt ceiling crisis simply by canceling the debt held on the Fed’s balance sheet. The Terror Within: Black Hawks and Homeland Security. Check out The Covert Report with Susan Lindauer. My guest was National Security Expert & former Border Protection Officer Julia Davis was branded a “Domestic Terrorist” for exposing glaring shortcomings within the Department of Homeland Security. It started on the 4th of July, and required all the courage a True Patriot could possibly require. Quickly it becomes clear that Julia Davis threatened the expansionist, money making ambitions of the Homeland Security bureaucracy. There has never been a case of this magnitude, including a Blackhawk helicopter raid of the whistleblower’s residence with a Special Response Team, two malicious prosecutions and false imprisonments, four witness deaths, including sinister insight to the death of Hollywood starlet, Brittany Murphy, the mob working in concert with the Department of Homeland Security/Immigration and Customs Enforcement (DHS/ICE) to silence a brave truth-teller and her supporters. Julia’s saga is featured in an extraordinary documentary film: “TOP PRIORITY– The Terror Within.” TOP PRIORITY will blow your mind. Its powerful statement is backed by court rulings, hard hitting facts, video and audio recordings, including video of “sneak & peak raids” on the home of Brittany Murphy, which raise disturbing questions about the surprising and untimely deaths of Brittany and her husband– neither of whom were drug addicts as Hollywood media tried to portray. Nothing has exposed the ugliness of Homeland Security’s Stassi appartchik like Julia Davis’ story. The US intelligence community has been put to shame by one lone Christian nun. Her modest study of the videos of the Syrian chemical attack shows they were productions involving staged bodies. Those who take the time to read the report by Mother Agnes and the International Support Team for Mussalaha in Syria (ISTEAMS), which has been sent to the United Nations, will realize that it disgraces the entire US intelligence community for endorsing video footage that is clearly dubious and not credible upon careful study by even a layperson. No one denies that chemical weapons were used. The US federal government and the mainstream media in the US and its allies have been playing a dirty game of equating the a) rejection of accusations that the Syrian government used chemical weapons with b) an outright denial that chemical weapons were used. The two are deliberately being mixed together to confuse the general public. The question is who used the chemical weapons? 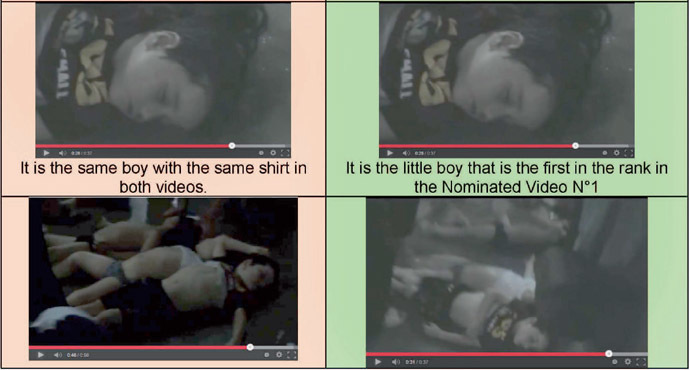 Little boy in red shirt in video from Zamalka (left) is seen with other children in video from Jobar (right). Photo from Mother Agnes report to UN. What is the US intelligence community? Before I go any further, it has to be emphasized that the US intelligence community is a collective of all the intelligence bodies of the US government, which is formed by 16 different intelligence agencies. Out of the agencies that form the US Intelligence community, one belongs to the US Treasury, one belongs to the US Department of State, two belong to Homeland Security, two belong to the US Department of Justice, one belongs to the US Department of Energy, eight belong to the Pentagon, and finally one of them is the Central Intelligence Agency (CIA), which is independent from any US government department. Same footage is used in different videos with different scenarios, according to the report. Photo from Mother Agnes report to UN. Nonetheless, this gargantuan body could not see what Mother Agnes Mariam has found and submitted to the United Nations. It is job of the agencies of the US intelligence community to examine these videos and to authenticate them. But they failed either to serve US foreign policy, or to show professionalism, or both. Instead they nominated a sample of footage from Syria as a means of proving that (1) the chemical weapons were used in the Damascus suburb of East Ghouta and (2) that the Syrian government was responsible for the diabolical attacks. The US intelligence community selected 13 videos that the Obama Administration has used in their case against the Syrian government. These videos need to be carefully looked at. The emphasis that US Secretary of State John Kerry put on the videos in his scripted speech to reporters on August 30, 2013, came across as ingenuous. Kerry notably refers to the footage from Syria and constantly uses the words “our own eyes” and “seeing.” He even asks that the videos be watched by the general public. He should have been taken to task on this, and he was through the study that Mother Agnes has produced. A RED FLAG– There is an almost total absence of adult corpses next to the bodies of the children. Nor is there footage of parents, especially mothers, coming to claim their children. Where were the parents? From a cultural context–where mothers are rarely separated from their children– this is strikingly odd. It is highly unlikely that the parents, especially the mothers of all these children, would have left them alone or not rushed to where their bodies were. There would be much wailing and grief. There is none. Why? At least 9 children in the video of the Press Office of Al Marj Region (right) have been transported from Kafarbatna (left) “out of any medical or humanitarian explanation”, the report claims. Photo from Mother Agnes report to UN. If the parents were not killed, then where are they? If the parents, especially the mothers (following the gender script of Syrian society), were with their children, then where are the mothers’ corpses? One video states that all the bodies are dead. Yet we see that the some of the corpses are being injected with an unknown liquid. Why? In the footage of one burial, only eight people are buried and three of them are not even covered in white shrouds, which is a compulsory ritual. Were these people murdered by the insurgents and disrespectfully buried without the proper rituals, as a sign of disdain? Moreover, the identities of the dead have consistently been withheld. There is more to say on this and it should be kept in mind. Mother Agnes also points out that there is virtually an absence of the sound of ambulances, and that in the testimonies used by the West, individuals claim to have smelled the chemical that was used. Sarin gas, however, is odorless, which raises important questions about the testimonies. Even if one dismisses some of Mother Agnes arguments, some observations in her study are undeniable, and suggest scenes have been stage-managed. For example, some of the same bodies were planted or recycled in different scenes and different makeshift morgues. In other words, the same bodies of the same children are spotted in different locations. That leads to the undeniable conclusion that some of the children were being arranged and moved around. Many bad things have happened in Syria, including the chemical attack in East Ghouta. Yet there many questions that have to be answered. There was a massacre in Latakia on August 4, 2013 that went unreported. After the massacre, surviving children are known to have been kidnapped by Rebels. The mainstream media in the US and West failed to cover this or casually passed over it, obviously because it was inconvenient to expose war crimes by U.S backed rebel groups against ordinary Syrian people. The study mentions that the relatives of children abducted by the US-supported insurgents have come forward to identify their relatives in the videos from the chemical attacks. It paints an ominous picture that the bodies of these children were prostituted by Rebels to open the field in Syria for a foreign military intervention. Regardless of whatever position one takes on Syria, it is their responsibility to analyze the videos from the alleged chemical attack and pay attention to observations of Mother Agnes Mariam’s report. Let’s be clear here. The people of the US and the world have won a huge victory over a war-obsessed US government and an administration that was hell-bent on yet again launching a criminal war of aggression against a country that poses no threat to the US or its neighbors. Overwhelming public opposition in the US and the nations of Europe, as well as most of the rest of the world to a US strike on Syria have forced the US to falter and to accept the idea of a compromise deal offered by Russia. The Obama administration by all accounts was facing an unprecedented defeat in Congress of its proposed Authorization for the Use of Military Force (AUMF) to launch a new Middle East war, this time on the nation of Syria. It is now desperately trying to spin the bad news, with the mindless support of the US corporate media, so as to claim that it has won some kind of victory. The White House, absurdly, is arguing that the Syrian government’s apparent agreement to a surprise Russian plan to place all Syria’s chemical weapons stocks under international control and then to destroy them is somehow the administration’s doing. The reality: it was a quick move by Russia’s foreign minister, Sergei Lavrov, to grab hold of what Kerry’s State Department staff quickly labeled a “rhetorical slip” by the serial-lying, war-promoting US Secretary of State John Kerry, and run with it, that has produced this backdown by the US administration. Russia’s Foreign Minister Sergei Lavrov, hearing this bumbling answer, took Kerry at his word and immediately announced that Russia would seek Assad’s agreement to such a plan, and would help to ensure its implementation. Prior to this surprise development, the US was offering Syria no deals. Indeed, the Obama administration was in the midst of a “flood-the-zone” lobbying campaign in Congress and the media, promoting its plan for an aerial blitz of Syria, with Obama scheduled to make a televised pitch at 9 pm ET today to pump Americans up for war. In order to win support from normally war-crazed Republicans, the White House was expanding the stated goals of the bombing campaign from just a short “shot over the bow” attack to a longer and wider bombing campaign designed to “degrade” Assad’s military and to shift the balance in favor of rebel forces seeking to overthrow the government. There was no talk of any compromise or of any peace feelers; only talk of “red lines” crossed by Syria, and the need to maintain America’s and the president’s “credibility” by striking Assad without mercy. Ships, aircraft, troops and bombs were in place around Syria, in preparation for an attack, which at one point last week seemed just days away. But as the days have gone on, urgent constituent messages to Congress have poured in, reportedly running 540:1 against a US attack. Britain’s parliament last week voted solidly against allowing that usually supine US ally from joining in an attack, and even in France, where President François Hollande had enthusiastically volunteered to have his country join in the US blitz, public opposition has been enormous and growing, forcing him to back off in his support for war. It’s not over yet, but it appears that the Obama administration, sensing that it was facing a humiliating defeat in Congress, with perhaps both houses rejecting a war authorization to attack Syria, has decided to grab at the Russian escape offer. It is important that the administration and the corporate media not be allowed to “revise” the history of this crisis to claim that the Obama administration won a victory against Syria and its military and diplomatic backer, Russia. The opposite is true: For the first time in over a century and perhaps in US history, it appears that a US president has been forced by public and international pressure, both at home and abroad, to back down on a plan to attack another nation. This is a huge change in fortune for the imperial war-mongers who, only a decade ago, were talking about the US being the world’s “only superpower,” and about establishing “full-spectrum dominance” over the entire world and preventing other nations from ever achieving the power to challenge the US. Ten years, two losing wars and at least five pseudo-wars later, China and Russia, separately and working together, have shown that they cannot be so easily bullied, and that they can stymie US power. A resurgent Russia had already announced that if Syria were attacked by the US, it would come to the aid of its ally, and Russian President Vladimir Putin had put teeth in that warning by sending the latest anti-aircraft and anti-ship missiles to Syria, and by ordering Russian warships directly into the Eastern Mediterranean where the US had been building up an armada of Tomahawk-missile-equipped destroyers, aircraft carriers and Marine-filled landing ships in anticipation of an attack on Syria. These measures, taken together, had to be viewed with alarm by US military strategists. If Russia’s peace initiative succeeds, with Syria turning over the chemical weapons stocks (that, as the NY Times reported, it initially developed over the years with the knowing support of British, French, German and US corporate suppliers), it will be a huge blow to the US imperial enterprise. The US government has finally blinked. More importantly, the American people appear to have begun to finally awake from their 9/11-induced trance. Attempts by Obama and Kerry and by fatuous shills like Republican Sens. Lindsay Graham of South Carolina and John McCain of Arizona to claim that somehow Syria’s chemical weapons posed a threat to this country were never taken seriously by the public this time around, even despite shrill scare stories in the US media. Photos and videos of dead gassed children, while eliciting horror among citizens, did not lead to the usual pro-war stampede, as we have lost our blind trust in what our leaders tell us. 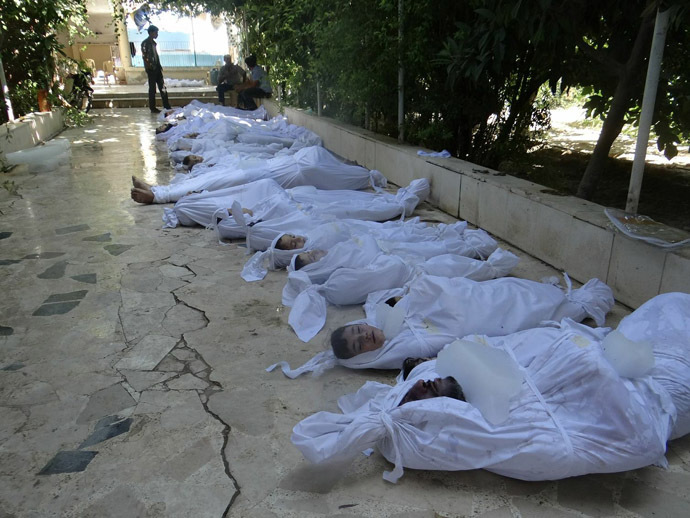 There was a willingness among the public, for a change, to listen to those pointing out that the administration has no solid evidence to prove that the poison gas attack on Aug. 21 was the Syrian government’s doing. The coming months will be critical. The war-mongers have been seriously weakened this week, but may feel the need to re-assert themselves by orchestrating some other “existential threat” to America that the public will buy into. All those who want to live in a peaceful world, who want the US to cease being the world’s leading terrorist state, and who want this country to become a law-abiding part of the international community, need to remain vigilant. To keep the pressure on Congress and the President not to go to war in Syria, go to this site for things you can do. Hishem, a Palestinian, sits with us in the shade of an olive tree in front of his home in Wadi al Hussein, Hebron. His children are playing on the hill behind us, and directly behind them stands the vast Israeli settlement of Kiryat Arba. There, a man – a settler – is standing on his balcony watching us. It is hard to know where to start when trying to explain the settlers of Hebron. They are at the heart of the problems here. One of my first encounters with them was on my second proper day of work, when I was walking down Shuhada Street and found myself on the wrong end of an egg thrown by a little settler boy of 7 or 8 years old. One of the local shopkeepers, Munir, has now nicknamed me ‘Umm Baydah’ or ‘Mother Egg’, for being the first of my group to be hit by one. He said “now you are a Palestinian”, and told me to start a tally count. You might think, what kind of parents give their children things to throw at people walking down the street? But eggs are the least of it. Hishem’s extended family has been attacked, had their windows smashed, their homes set on fire and even been shot by their settler neighbours. The settlers of Hebron are a religiously motivated group of Israeli Jews who occupy four areas, known as settlements, in the centre of H2 (Israel-controlled), Hebron, and two settlements in the Wadi where Hishem lives. They are known for their willingness to use violence, harassment and intimidation against those they perceive to be standing in the way of them achieving their goals, which are primarily to rid the city of Palestinians. The settlers never refer to Palestinians, always to Arabs because they deny that there was ever such a place as Palestine or such a people as the Palestinians. They say that the Palestinians should leave and go to one of “their own” Arab countries. All settlements, including those in East Jerusalem, are illegal under international law. Every country in the world recognises this except Israel. From some of my stories so far, it might seem like there is one set of rules for Israelis and one for Palestinians. That’s because there actually is. In the West Bank the Israeli authorities enforce Israeli civil law on settlers, but military law on Palestinians. The settlers believe in Eretz Israel – greater Israel – that Israel should permanently encompass the Palestinian territory of East Jerusalem, the Gaza Strip and the West Bank. These are the areas currently occupied and/ or controlled by the Israeli army. Some settlers believe that Israel’s borders should stretch even further afield than this into other countries. Their beliefs contradict all international understandings of where Israel’s borders should be. These are the nuts and bolts of the daily battle being played out in H2. Everything is about who owns what, who can walk or drive where, even who can stand where. Hebron is the only city in the West Bank to have Israeli settlers living in its centre. The city is of religious significance because it is where Abraham and his sons and their wives lived, and are buried. It is the second holiest site for Jews, the fourth holiest site for Muslims, and is also of significance to Christians. The settlers believe that they are doing God’s work in ridding Hebron of Palestinians, and dream of turning it into a Jewish city. But I don’t know of any God that would approve of their behaviour. Ironically, there tends to be most trouble on Friday nights and Saturdays – the Jewish Sabbath. One of my jobs is to be present whilst hundreds of settlers walk from Kiryat Arba through a Palestinian neighbourhood to pray at the synagogue on a Friday night. Dozens of extra soldiers are bussed in to protect them but some of the settlers carry their own rifles too. I find it quite bizarre, and certainly one of the least holy sights I have ever seen. On the Sabbath last week, a colleague from another international organisation saw a group of teenage settler girls spitting at a group of Palestinian girls on Shuhada Street. Again, not so holy. I met Nadar, Noocha and their family, who showed me their windows which were smashed by settlers. They live next to the synagogue in Hebron. A Palestinian I meet called Hani tells me he does not believe that the settlers follow the true Jewish faith. The settlers seem to be willing to do almost anything to achieve their aims. This short film clip, from Israeli human rights organisation BT’Selem, first shows one of the settlers explaining things for herself, and then some of her actions. At least watch the first 2 minutes if you can – I’m pretty sure you’ll be shocked. You might have noticed the solider standing by whilst the settler abuses her neighbour and then the solider pushing the Palestinian woman, rather than dealing with the settler children attacking her home. Palestinians often report that soldiers do nothing whilst settlers are on the attack. I have already seen for myself the close relations between many settlers and soldiers, with settlers bringing food and drinks to soldiers throughout the day, and even settler children playing in military watch points whilst soldiers are on duty there. Hani, Reema and their family live just past the caged house in that BT’Selem film clip, by the settlement of Tel Rumeida. They have to walk past the settlement and through the yard of an Israeli army base to get to their house. They can’t take a car to their house. They have been harassed and attacked by their neighbours many times. The settlers have even tried to burn down their home, and have come in the night to smash it up. About a month ago, they tried to burn down the family’s 300 olive trees for the ninth time, scorching the land, and making some of it impossible to harvest this year. Burning and chopping down olive trees is a common tactic of settlers across the West Bank. One of our duties on the Sabbath is to spend time sitting on the roof of the Abu Shamsiya family’s home in H2. The flat roof of the family’s home backs onto Shuhada Street, and has a small Israeli army watchtower on it which does not appear to be used at present. From the roof you can look out across the city of Hebron, and down onto the family’s terrace below. The terrace has a cage around it to try and stop the family being struck by objects thrown by settlers on the roof. In the past, these objects have included eggs (they seem to be a favourite) and stones, and settlers have even urinated on them. So the reason for our presence is to deter settlers from coming onto the roof. The first time I sat there, we prevented three settler groups from coming onto the roof. A teenage boy in one of them had a rifle slung across his person. On Tuesday, we were unable to prevent one settler coming onto the family’s roof when we were there. He pointed at the view of the Palestinian city, “This is Israel” he said. ”It’s Palestine” I said. “Lo” (no) he said. Another group that my colleague saw gestured at the view of the Palestinian city and said “All of this will be Jewish”. Virtually every Palestinian home in H2 has a kind of cage across the windows to try to guard against settler attacks. It is hard to get used to seeing children waving and shouting hello to us from behind these cages. On Monday last week when I was doing the lunchtime school run (accompanying Palestinian children to Cordoba School down Shuhada Street) about 150 settlers, most of them teenagers, arrived apparently on some kind of tour. Remember – they can go anywhere in H2 but the Palestinians are very restricted as to where they can even walk. The settlers were congregating at the bottom of the school steps. When it came time for the kids to go home from school, many of them were scared to go down the stairs because of the settlers. I walked up and down the steps with them, to try to make them feel more secure, and it seemed to give them confidence to be able to get home. Although the truth is that I had no way of knowing whether the settlers would cause trouble. Luckily, the worst they did was to stare at us all, and shout and throw things at the feet of my male colleague who arrived to help me. Not all Israeli settlers are religious extremists like those in Hebron. Some, who live in settlements in Palestinian East Jerusalem for example, are economically motivated. They are attracted by the housing subsidies that the Israeli government provides in many settlements. Wherever they are located though, there is no doubt that the settlers and settlement expansion, are a major barrier to peace between Israel and Palestine. Hani and his son have both spent time in prison for retaliating when settlers have attacked them. But Hani tells me that he now believes in non-violent resistance because it gets more positive results. He says it helps him to separate hatred for a policy from hatred for a people, and believes that it can help those in other countries, especially Jews, to see what is happening here. “At the end of the day, it’s our right to our land,” says Hani. “We are here, and we will stay here. This is our land.” says Hishem. “We will stay here in a tent if we have to, we will not leave,” says another. Many of them could not afford to go elsewhere, and where would they go anyway? Over 60% of the West Bank is directly under Israeli control. And many of them, like Hishem’s family, have already been refugees once from the time that the State of Israel was created. And why should they leave? As international law confirms, this IS their land. But there is another reason, one which is about the Palestinians as a people. The truth is that they must not leave if the dream of having a Palestinian state is ever to be realised. The settlers and the soldiers must not succeed in cleansing Hebron – or anywhere else in the West Bank – of Palestinians. Just knowing that makes being here worthwhile.